55-year old man was referred to our outpatient clinic for the endocrinology department. He is known with a neuro-endocrine tumor (NET) in his small intestine with known liver and lymph node metastases. He is currently treated with octreotide. 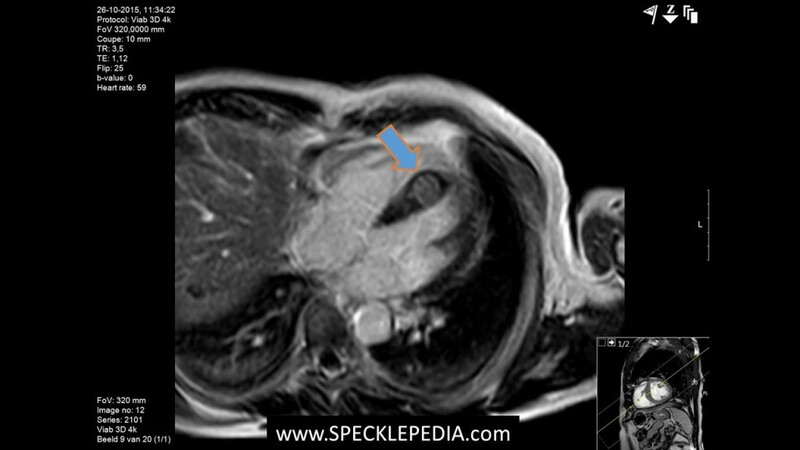 A routine follow up PET-scan showed a “hot-spot” in the LV myocardium (scan shown below). He was free of any cardiac complaints (good exercise capacity and no palpitations/syncope). His ECG was normal. The ultrasound is shown below. Deformation imaging findings are shown. The global longitudinal strain in this patient is -18.6%, a low-normal value. 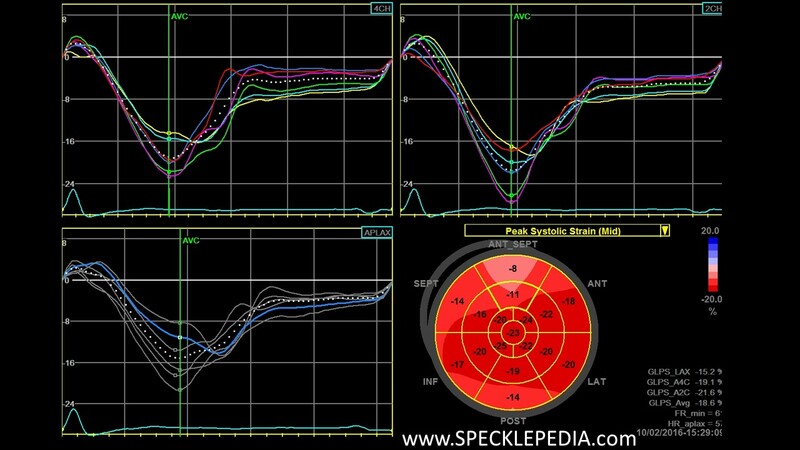 Regional assessment shows a reduced peak systolic strain in combination with post systolic shortening in the region of the tumor. 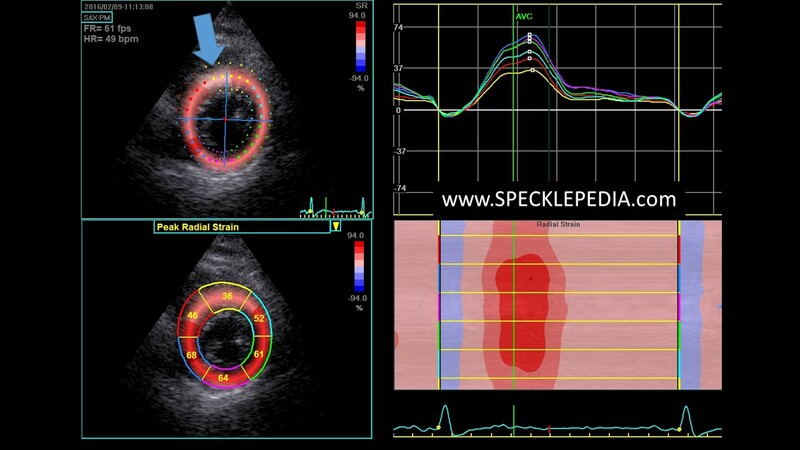 Peak systolic values of -8 to -11% suggest some remaining function and is most likely due to the normal contracting myocardium adjacent (endocardial en epicardial myocardial fibers) to the tumor. We also noted the reduced strain values in the surrounding segments. This is most likely due to “partial volume effect”, where the margin of the tumor protrudes in the analysed segment, inducing only a moderate abnormal deformation. 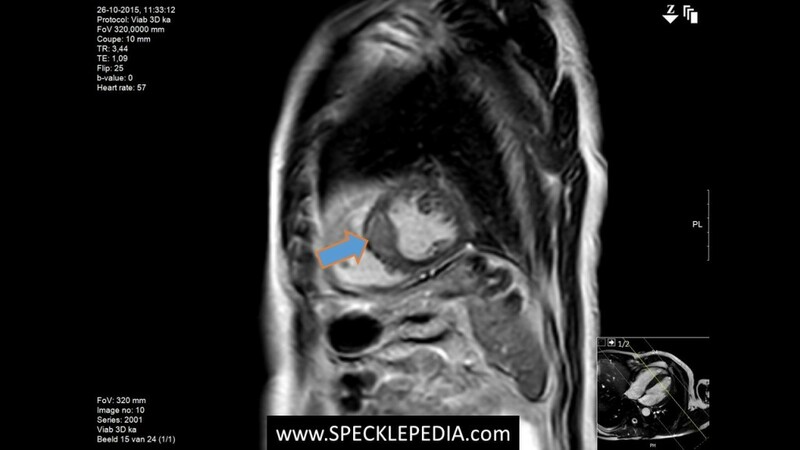 The site of the tumor on 2D imaging is indicated by the blue arrow in the APLAX view. 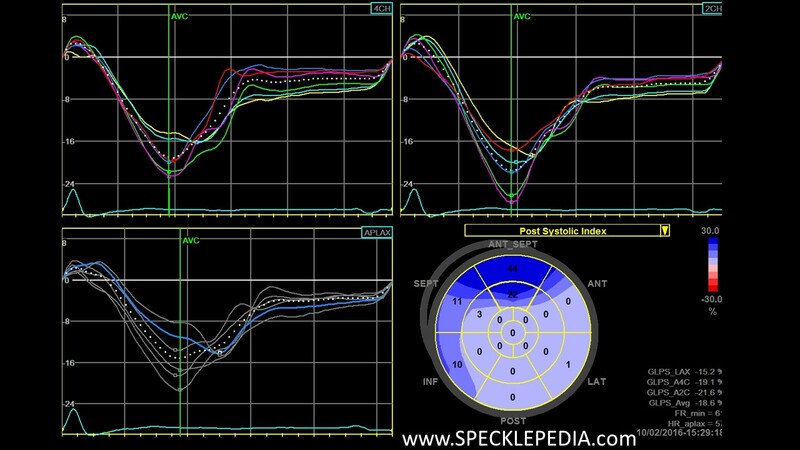 At this site, there is a clear abnormal longitudinal deformation (delayed onset of shortening, a reduced peak systolic strain value and post systolic shortening. 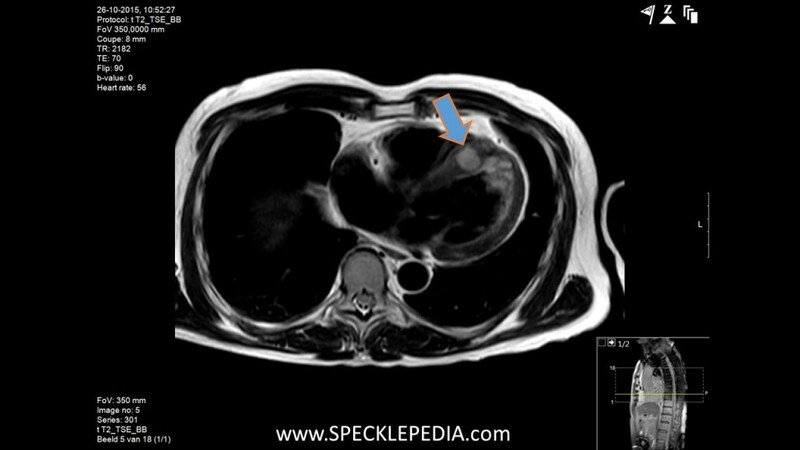 In the short axis view we have also indicated the site of the tumor by a blue arrow. 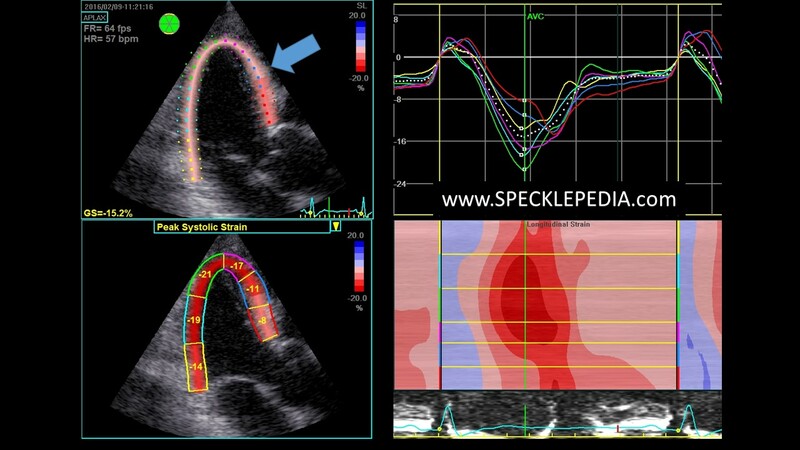 At this region, the radial strain is also reduced to a value of 36%, while the healthy myocardium shows a peak systolic radial strain of >60%. 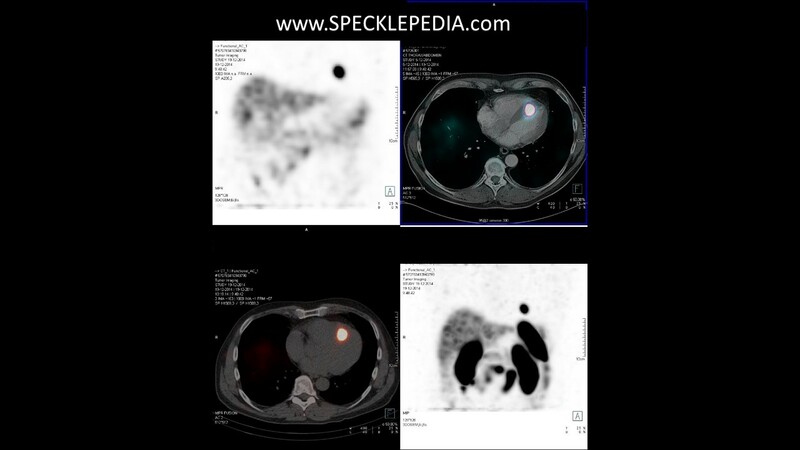 The image below shows a detail of the whole body somatostatin receptor scintigraphy (octreotid PET scan). A singular “hot spot” is seen in the interventricular septum. This fits with a metabolic active metastase of his NET.